March 2006: I've added info at the end about how to point to a directory of templates. SpreadsheetConverter to Java generates a JavaServer Page and a JavaBeans for each Excel spreadsheet that it converts. Sorry, it just doesn't work - no hair left. I have a presentation to prepare, so using Powerpoint. I am looking for answers to the problems I have been having with OOo templates. In a nutshell, they just don't work. I have gone through the steps you outline, modified styles, saved them to a template, saved it, created a new document and found that the styles change randomly from one instance to the next. In my book, Open Office is now a pain in the neck, a time-wasting exercise. There are too many fiddly bits to it, not enough one-and-two click processes, not enough management tools. The addition of unreliable results is just too much to ask. I'm sorry you're having these results. Are the fonts changing between different computers, or different printers? If between different computers, check the fonts and try a font substitution under Tools > Options > OpenOffice.org > Fonts; or just copy the appropriate font files. If between different printers, choose Tools > Options > OpenOffice.org Writer > Compatibility and unmark Use Printer Metrics at the top. Also, go under Tools > AutoCorrect, click Options, and unmark everything except the top item, Use Replacement Table. The Replace Custom Styles option is a nasty one. I want more selcetion on openoffice writer. 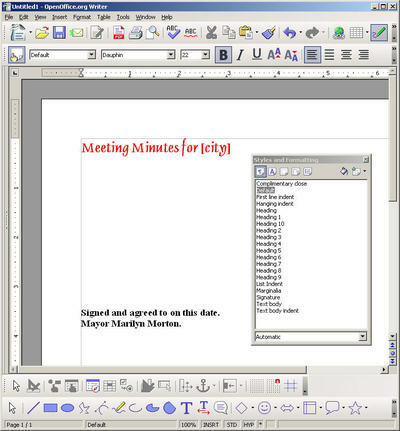 I want to write a document for some one and Old English is on a writing type in my section where is says like new roman times and such how do I add more writing types in my openoffice writer? If you need more fonts, you just need to copy the font file over and it will show up in Writer. Ask someone who has the font on their computer to give you the font (if, of course this is legal ) or you can buy the font on a web site that sells the fonts for your operating system. Then copy the font file to one or more of the Fonts directories on your system, or follow the font installation instructins from your vendor or for your operating system. Please tell me if the templates can be opened in MS Word 2003 and how do I get Opensource. Can we do the same templates with MSWord. I am real new to computer software. I am trying to create a template with multiple picture placeholders. However, when I save the template and then try to pull it back up in a new document, they are not the picture placeholders just the icon. Is there some way for me to save the placeholder for use in subsequent documents? How are you creating the picture placeholders? I run into a problem with the templates for a presentation: On the lower right I place a Logo with some margin to the right border. When I change that template and apply it again to an existing presentation, the logo will move straight to the right border. Any ideas how to fix this? I'm trying to figure out how to create a new document based on an OpenOffice template from gnome or the command line. When I double-click on a Word template (foo.dot) in gnome, Writer creates a new untitled document based on that template, which is what I want. But when I double click on an OpenOffice template (foo.odt), it opens the template itself, rather than creating a new document based on it. Since I don't generally keep Writer open all the time, when I want to create a new document I'd like to be able to just double-click on the template I want, rather than running Writer, which creates a blank document, going to File->New->Templates and Documents, selecting the template I want, and then closing the extraneous blank document. Is there a way to make Writer create a new document by default when given an OpenOffice template on the command line? This is so unclear! I came to this page looking for a guide on how to MAKE the template - you just say "make it, whatever" and save it. How is that supposed to help me? There's no other tutorial so this was my last hope. Telling me to put in anything, whatever, isn't really a tutorial. I'm sorry you didn't find what you needed. I can't really tell you what to put in your template because it is possible to do anything. Are you making a template for a brochure, a report, a certain type of spreadsheet, a calendar, or ? Making the content and formatting it isn't special for a template. You just add content by typing or inserting pictures, then format. The part that I was focusing on was, how do you preserve this document, now that you've made it, and put it in a place so that you can A) easily access it again and B) not overwrite it with your new changes when you do. 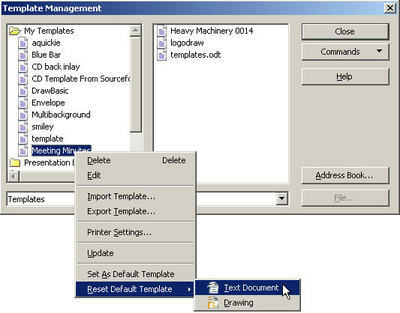 File > Save as a template file just makes a template, but doesn't put it into the OpenOffice. main template repository. You still need to add it to the repository by copying it to that directory, or by choosing File > Templates > Organize, clicking and holding down on the Commands button and choosing Import and finding the template you just saved. To get to the repository, choose File > New > Templates and Documents. Click the Templates icon at the left and all the templates, regardless of the method you used to create them and add them to the respository, are there. 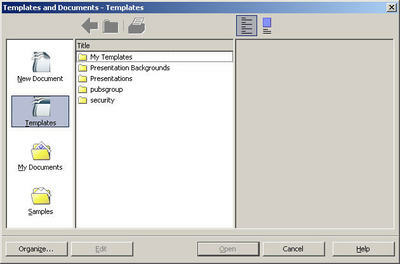 Also, templates from the repository show up in the Wizard when you choose File > New > Presentation. To turn a PPT file into a presentation template that comes up in the wizard, just open it and choose File > Templates > Save. If you have a whole bunch of PPT templates to turn into OOO templates, see this entry. I'm sorry. I failed to see your other post on "styles." The program turned out to be more intuitive than I realized, as well. I believe I fixed the problem. Feel free to delete my angry post. It would take a huge tutorial to cover formatting as well as all the template stuff. - or click the Outline tab at the top, select all, set the font, etc. Then click the Normal tab to go back. Templates don't seem to want to work for me. Have followed the above steps pointing to folder many times and still cannot get my folder of downloaded OO templates to show up in the template options screen. Spent way... way too long on what should be a simple task. Have given up on OO templates completely but not OO. May just keep them in a separate folder to pull from directly. Seems only way? Hey!! Amazing how such an old blog still has such an effect on us "open-source newbies." I'm sold! Thanks for your help. Avery product for that matter). Very little is impossible in OpenOffice, it just doesn't have the huge prefab set of templates with it. However, if you have a postcard in Word, just open it from OpenOffice.org and it should work. You can also just set the page size to 4x6 (or whatever the measurement of the card you want) under Format > Page, Page tab. This will work in Writer or in Draw. Here's another blog entry to check out. There's a section that deals specifically with postcard templates. When creating a template for Calc, is there a way in the template to designate a default directory for saving only those documents created from that particular template (not changing the default save directory altogether)? Thanks. Sorry, I don't know of any. Cool feature, though. You could probably write a macro to do it but that's not my field. Great job, Solveig. My daughter asked me how to import a PPT preso as a template for OpenOffice and I generally followed your steps (actually, I walked her through the process while looking at your blog entry). I am creating a simple template. And I have inserted some images in the header region. I want them to become part of the template. I am uisng File->Templates... and saving it. 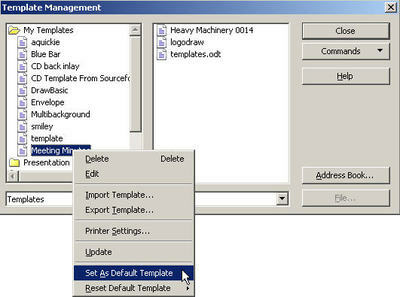 But the template require that the inserted image files to be present externally in the current directory. If I remove those files there are empty boxes in the template showing the file path. How can I insert the images so that are internal to the template. Please help. I really have tried tens of times with the same result. Shipping images along with templates is so INELEGANT. Absolutely! See the blog entry on graphics and Writer documents, to be posted in about 15 minutes, for May 5th 2008. I created a template for personal letters, which is really just a logo-graphic in the lower-left corner of the page. It's not exactly small, so printing it consumes a sizeable amount of black ink. I printed one page and had it photocopied. The idea being, that I could create the letters in the template on the screen and then print it without printing the logo every time as well. I'm sure there is a setting in Oo Word that makes this possible but I can't find it! Can you please help? To not print the graphic, choose File > Print, click Options, and ummark the Graphics option. Click OK. Thanks, Solveig. I worked out an answer, which was to open a page set up with the regular margins and draw a box in the lower left corner. I had the height and width dimensions of the graphic so it was easy enough to position that where the graphic would be; I then removed the outline and saved that as a template. It worked fine, but your solution is much easier. I would just, in OpenOffice.org, create a new text document, choose format > page and make it landscape with half inch left and right margins, then choose insert > Frame and make a 5 wide by 3 high frame. insert three more and arrange them as you need to.